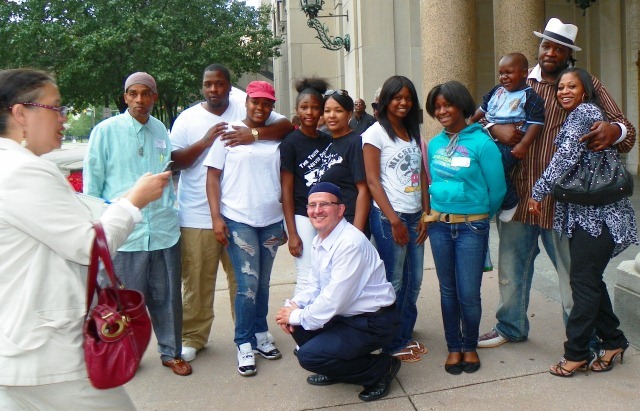 Davontae Sanford’s family and supporters outside appeals court after Aug. 8 hearing. His mother Taminko Sanford-Tilmon and his stepfather Jermaine Tilmon are at right. 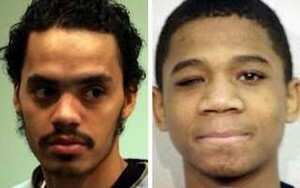 Vincent Smothers (l) confessed to killings for which Davontae Sanford (shown at 14) was convicted. 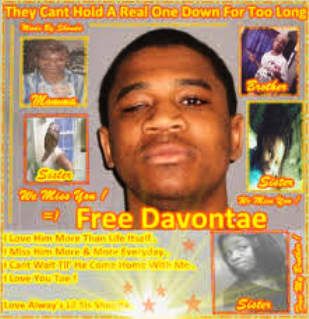 DETROIT – A Michigan appeals court ordered Sept. 26 that admitted hit man Vincent Smothers and his attorney be allowed to testify on behalf of Davontae Sanford, currently serving a sentence of 37 to 90 years for four murders on Runyon Street on Detroit’s east side in 2007. Sanford, 14 at the time, confessed to the killings during a lengthy police interrogation, without an attorney or parent present. The case has drawn international publicity. Smothers, serving 50-100 years for 10 other drug-related killings, said in a sworn affidavit and in an AP interview last year that he and an accomplice committed the murders on Runyon, and that Sanford was not involved. He earlier confessed the killings to Detroit police, but Wayne County Prosecutor Kym Worthy did not charge him or his accomplice, and refused to drop charges against Sanford. 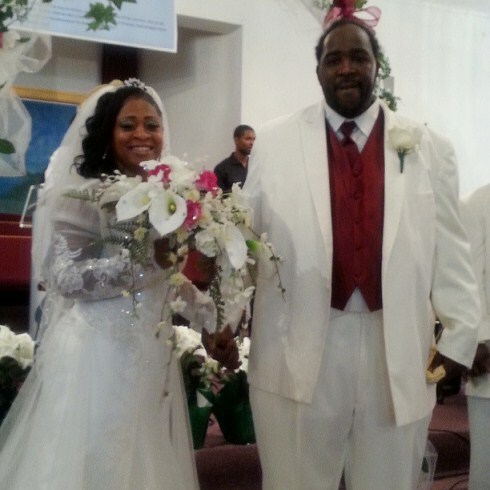 Davontae’s parents Taminko Sanford-Tilmon and Jermaine Tilmon at their wedding in July. Sanford-Tilmon said she has not talked to her son yet, but talked to him just two days ago, after he came out of “the hole.” Sanford has experienced ongoing harassment from the guards at the Ionia Correctional Facility, his mother has said. Sanford-Tilmon has five children and just married her long-time fiancé Jermaine Tilmon in July. Wayne County Circuit Court Judge Brian Sullivan refused to allow Sanford to withdraw his guilty plea on a claim of innocence after Smothers’ confession. The Appeals Court sent the case back to him for an evidentiary hearing, while retaining jurisdiction. The hearing ended up lasting two years. Sullivan repeatedly denied defense motions to allow Smothers or his attorneys to testify, discovery on Smothers’ other cases, and expert testimony. 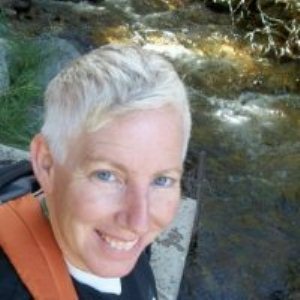 Kim McGinnis, now Judge at Tribal Court in Santa Fe, N.M.
“This is a big victory for Davontae,” Sanford’s attorney Kim McGinnis, assigned by the Michigan State Appellate Defenders Office (SADO) to the case, said. Gabi Silver, Smothers’ defense attorney. Pros. Kym Worthy testified at state legislature against ban on juvenile life without parole. By press time, Prosecutor Worthy’s office had not responded to a request for a statement on whether she would now drop charges against Sanford, as she just did in a similar case, that of Raymond and Thomas Highers. The two brothers, who are white, served 25 years in prison for murder until new witnesses came forward saying they saw a group of young Black men enter the victim’s home just before the murder, then heard a gunshot. The brothers were granted a new trial, and expressed shock and elation when Worthy dropped the charges Sept. 25. 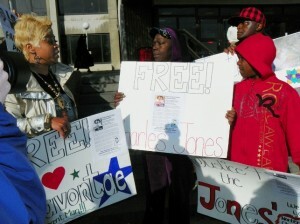 Taminko Sanford and Mertilla Jones at rally for Aiyana and Charles Jones, and Davontae Sanford April 23, 2012. Sanford has also received support from the family of Aiyana Jones, killed by Detroit police at the age of 7 in 2010. They demonstrated with the Sanford family in front of the Frank Murphy Hall in downtown Detroit earlier this year, demanding justice for Davonate, Aiyana, and her father Charles Jones, who is awaiting a murder trial based largely on statements of “jail-house snitches,” according to his attorney. 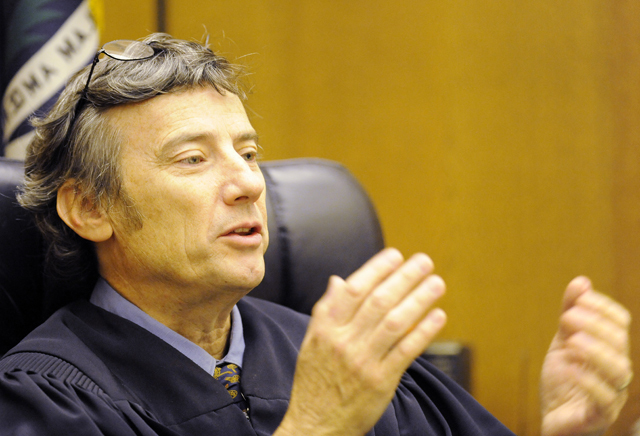 Appeals Court found WCCC Judge Brian Sullivan “abused his discretion” in Sanford case. McGinnis, now a Judge in the Pueblo of Pojoaque Tribal Court in Santa Fe, New Mexico, said she hoped that Worthy would at least allow Sanford to plead “not guilty” and go to trial without further evidentiary hearings in front of Sullivan. “We’ll be delving into an investigation of all of Smothers’ other crimes, so it will be a little while before we get back to court,” McGinnis said. She said she still must confer with her colleagues in SADO on trial strategy. 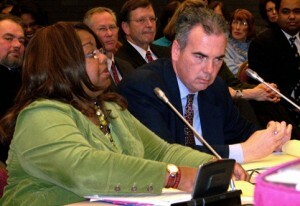 Wayne Co. Asst. 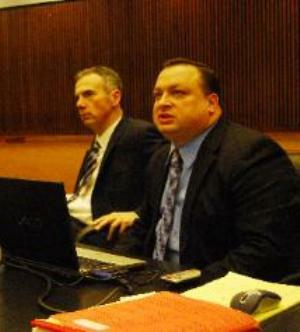 Prosecutors Robert Moran and Patrick Muscat. Moran is prosecuting both Aiyana Jones’ father Charles and her killer cop Joseph Weekley, while Muscat prosecuted Sanford during evidentiary hearing. 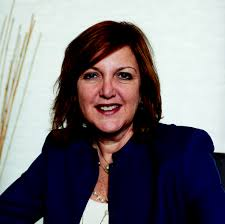 The Court said additionally, “We agree with defendant, however, that the trial court abused its discretion by not allowing Smothers’s counsel, Gabi Silvers, to testify regarding Smothers’s statements to her pursuant to Smothers’s waiver of the attorney-client privilege.” It said Michigan Rules of Evidence allow hearsay testimony in such circumstances. 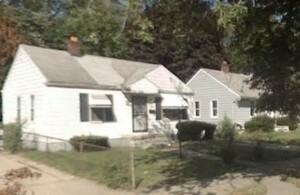 House on Runyon Street where killings occurred in 2007. It also said the Prosecutor’s office could have offered Smothers immunity in return for his testimony, in order to allow his cross-examination. During the course of the evidentiary hearing, Smothers twice invoked his Fifth Amendment rights on the advice of his attorney. But later, he agreed to testify regardless of the consequences in a sworn affidavit and an interview with AP reporter Ed White. According to earlier accounts, Smothers decided to voluntarily confess to 12 hit killings, most of them drug-related. He said he changed his mind about his way of life after killing Rose Cobbs, a teacher. She was the wife of a Detroit police officer who commissioned the hit outside a CVS pharmacy in Detroit while the officer was inside. The officer, who later allegedly hanged himself, was said to be having an affair with another woman. For further information on the case, contact Attorney Kim McGinniss at kimmcginnis2002@gmail.com. My concern is that DA’s are more concerned about covering their butts than justice. Everyone makes errors. It is how we correct them that shows real character. Why would the DA champion the white kids and not his case? Hmmm. Let’s look at the realities of a system that does not really care which black kid you prosecute as long as you convict somebody. It assumes that if you had ANY prior involvement with the justice system you are an interchangeable suspect. These cases are coming to light through advances in DNA and the internet age. It corroborates what people of color have been saying for years. American Justice is not colorblind. It locks more people then any other nation. Crimes against Native American women are not prosecuted and incarceration in the black community is now normal. How can prosecutors sleep at night knowing full well the person in custody or executed did not commit the crime? A moment to pause for all the wrongfully convicted whose overwhelming evidence would have cleared them. So worried about opening the floodgates of appeals? Then perhaps you examine your process and who it really serves. I saw this story on TV, it was hard to watch. My heart went out to him and his family. I cried like I was there with him when he got out of jail. I hope Davontae Sanford receives justice as well as my son and brother. Its a shame the system fails to many of us. This is excellent news and news we had been waiting for for a long time. Although the result was a bit different than what we fought for (that is, that the court would order the trial judge to allow Smothers to take the stand and confess on the record), it is still a win for Davontae because now we will be able to hear for the first time Smothers’ attorney give his confession to her in open court, with all the details and specifics of the murders that only Smothers knew. The court’s ruling ordering the trial judge to also allow an expert to testify about false confessions and police tactics is a favorable ruling too for Davontae because that issue was aptly argued by his attorney in yet another reason that his confession and resultant plea should have been withdrawn. These issues are also preservation issues for appeals to move along in the federal courts, if necessary. But what is necessary is for Kym Worthy to confess error in extracting a bogus plea based on a falsified confession and set Davontae free. She has the power, under the law, to file a confession of error and stop wasting more of our tax money and limited resources on frivolous appeals.